What’s Halloween without monsters? But not all monsters live under our beds or are the stars of horror movies. Some are real-life monsters found in America’s waterways. 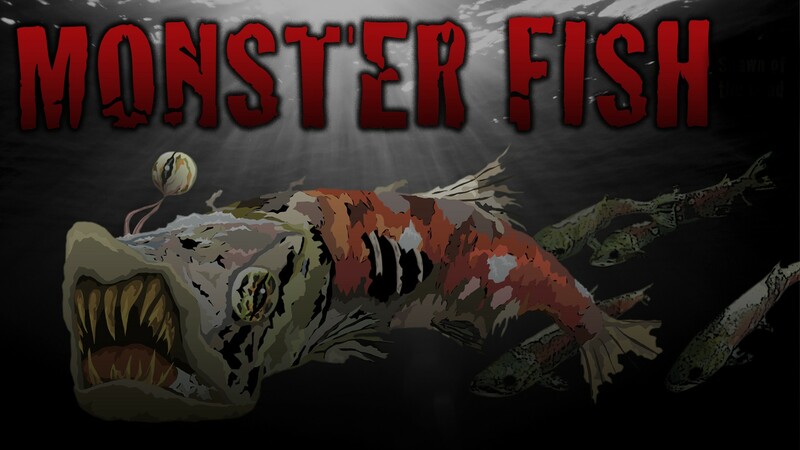 Though they’ll never be stars of slasher films or trick-or-treater costumes, monster fish can be terrifying but in some cases, they need saving too. There are monster-sized fish that can weigh hundreds of pounds. Some are shocking in appearance with beady eyes and mouths lined with sharp teeth. And then, there are the invasive monsters, steadily overtaking our lakes and rivers like alien monsters from outer space. Scary, yes! But each of these species are also a part of the aquatic-conservation mission of the U.S. Fish & Wildlife Service. So with Halloween upon us, here’s a little info on five different Monster Fish. 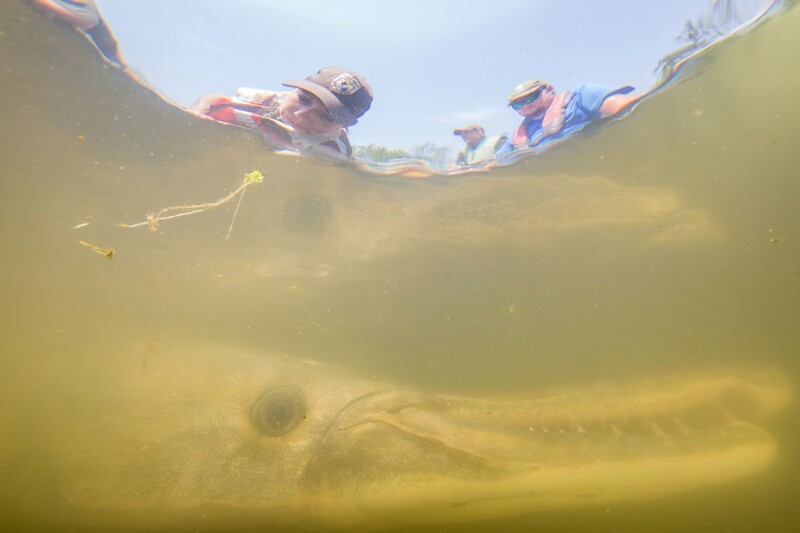 Alligator Gar underwater by Ryan Hagerty/USFWS. These fish get bigger than most humans! They can be over seven feet long and weigh up to 350 pounds! These predators have a mouth full of sharp teeth and are covered with thick, inter-locking bony scales. Alligator gar populations appear healthy in a few areas of the U.S. but less healthy in many others. Dams and levees have blocked access to traditional spawning areas and over-harvest has been an issue. What is even more concerning, when an alligator gar population declines, it can take decades to rebound. Good management practices and habitat conservation are vital. The Baton Rouge Fish and Wildlife Conservation Office in Louisiana along with other federal and state offices are working to restore habitat. 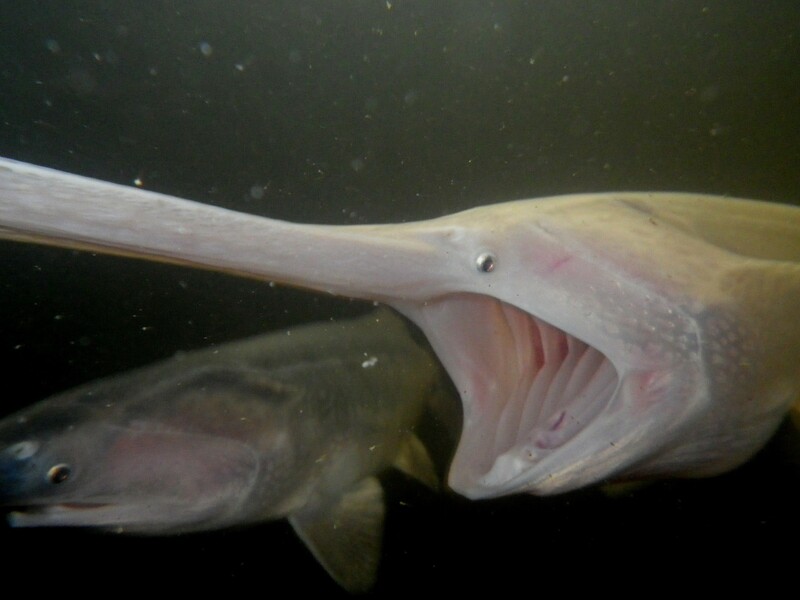 Several National Fish Hatcheries are raising alligator gar to stock back into our rivers. Photo: USFWS The prehistoric Gulf sturgeon can trace its ancestry back more than 200 million years. It has a tail like a shark, whiskers like a catfish, a tube-like mouth, can obtain lengths of 9 ft. http://bit.ly/2o2VuTU Photo by Ryan Hagerty/USFWS. You’ll find this living dinosaur lurking the dark depths of big rivers. Gulf sturgeon can weigh up to 300 pounds and have a tail like a shark, whiskers like a catfish and a vacuum-like mouth capable of inhaling its food whole. Instead of scales they have sharp, bony plates called scutes. 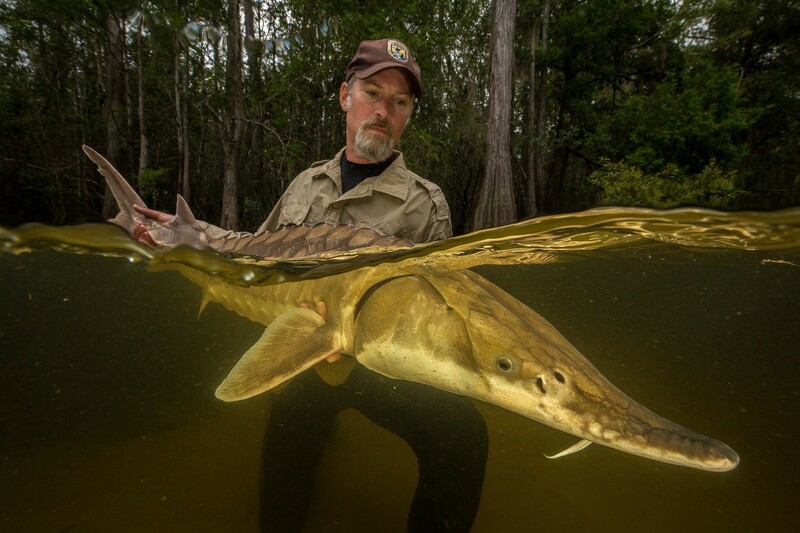 A long list of factors could be responsible for the decline of Gulf sturgeon. Before being federally protected, over-harvest was at the top of the list. Now this species struggles with the destruction and decline of its habitat. Dams and other man-made structures prevent or limit access to migration routes and spawning habitat. The gulf sturgeon is a threatened species and it is illegal to harvest or kill them. With a Recovery Plan in place, biologist and researchers are working hard to better understand how to protect and restore essential habitat and stop further declines across their range. Similar to whales, paddlefish feed by filtering plankton from the water. Electroreceptors help these fish find plankton and predict their movements. Photo: American paddlefish by Rob Holm/USFWS. This monster-sized fish has small, underdeveloped eyes, skin instead of scales, and a long paddle-like snout that can be more than half the length of their body. Paddlefish can grow up to 10 feet long and can weigh up to 300 pounds. This fish eats zooplankton, the tiniest of prey. Populations are declining because of habitat loss, overfishing, and barriers to fish movement, like dams. Paddlefish need large amounts of flowing water in order to spawn and reproduce. 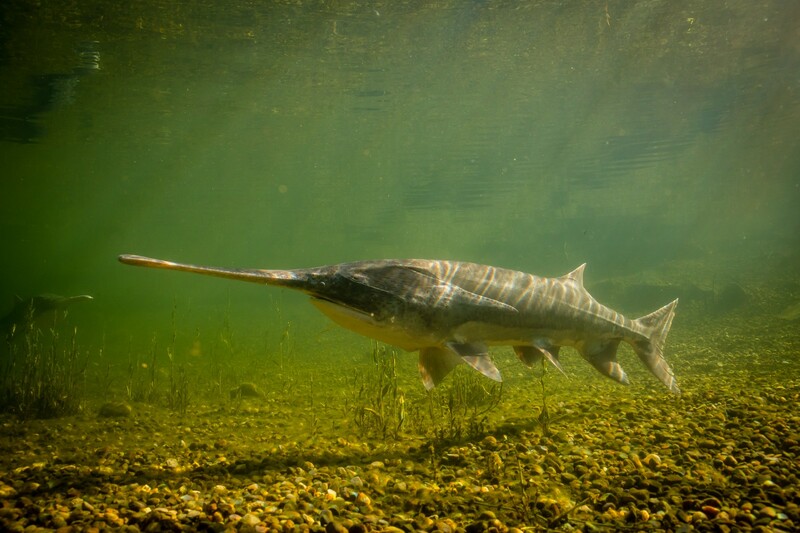 Biologists study paddlefish to better understand their need for survival. Fish are captured, tagged, released and followed using radio telemetry, a remote way to capture data transmitted to a receiver. The information is vital for learning about paddlefish migration and habitat. 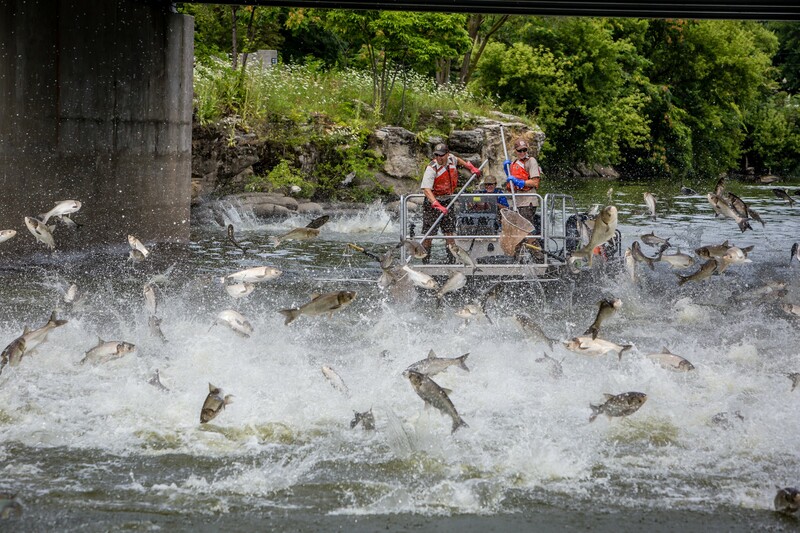 Asian Carp jumping by Ryan Hagerty/USFWS. Silver carp have broad heads, toothless upturned lower jaws, and can be found together in large numbers. These fast-swimming invasive fish can leap nine feet or more when startled. They can pose a danger to anglers and boaters when they fly out of the water at high speeds. Asian carp are a highly invasive species that will out-compete other fish for food and space, hurting native aquatic animal populations. And without a true stomach, they feed continuously. Even scarier, the female silver carp can lay up to 5 million eggs per year! There are several species of Asian carp — bighead, black, grass and silver carp. Offices like the Carterville Fish and Wildlife Conservation Office in Illinois work on prevention, control, and building awareness of Asian carp and other aquatic invasive species. After an invasive species is found in an area, control and management is set in place to help prevent further spread. Snakehead jaw open with teeth by Ryan Hagerty/USFWS. Its name alone is pretty scary. But this fish also has a scary and unusual trait — it can crawl out of the water and travel across land! It wriggles and uses its fins to “walk” to the next waterway. The invasive snakehead can survive out of water for several days if their skin remains moist. 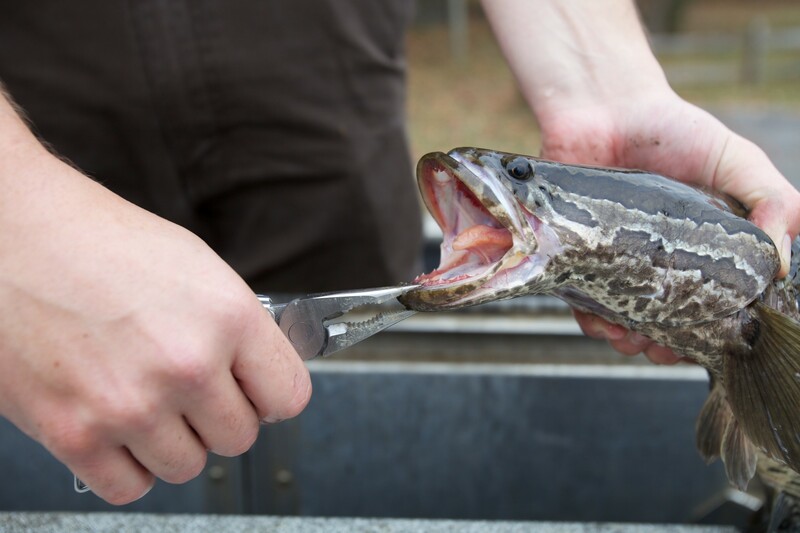 Snakeheads prey on native freshwater fish and shellfish, with a limitless appetite for both. And female snakehead will release up to 15,000 eggs at a time and may spawn up to five times a year! This species poses a real danger to the balance of sensitive aquatic habitats. State and federal agencies use survey data to monitor these fish and determine the most efficient way to reduce further spread. If you think you have caught a northern snakehead, do not put it back in the water. Please call your state fish and game agency.